According to a survey of nearly 500 media professionals, over-the-top (OTT) video is exploding in today’s marketplace. Close to three-quarter (72%) of respondents agree that offering OTT services is a viable revenue opportunity according to the 2017 OTT Video Services Study by Level 3 Communications, Inc., Streaming Media, and Unisphere Research. OTT is a good business strategy for competing in the marketplace. It can be ideal for a linear based video supplier, attracting viewers or new subscribers, distributing new content, and increasing profitability. Seventy percent of the respondents forecast that within the next five years, viewership of OTT video will surpass traditional broadcast TV. Nearly 85% of survey participants that currently offer OTT are very positive about revenue opportunities. Sixteen percent anticipate 50% or more increases year-over-year. 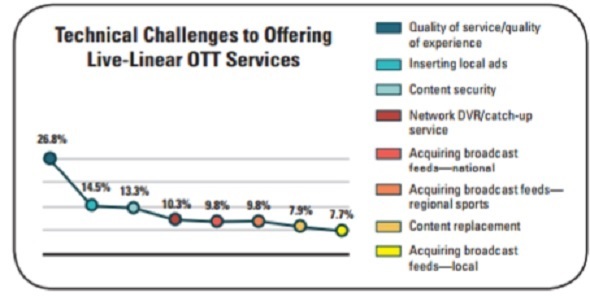 OTT is compelling for content publishers. Over the next three years, OTT will account for more than a quarter of overall revenue, according to nearly two-thirds of respondents. More than a third (34%) of respondents expect it to account for more than half of their overall revenue. Commercial challenges include competition from free services/direct broadcasters access, securing linear content rights and lack of consumer awareness/interest (roughly 17% each). Technical challenges include service and quality (27%), insertion of local ads (15%) and content security (13%). Of OTT providers, monetization strategies include a mix of subscriptions (42% 2016 vs projected 38% for 2017), advertising (35% in 2016 vs. 36% projected for 2017) and pay-per-view/event (23% in 2016 vs 25% projected for 2017). In terms of future content, 43% of OTT providers are actively researching VR content, 5% will launch soon, and 5% have already launched VR-video services. The remaining 47% report they’re not developing, creating or distributing VR-video content. This year respondents also focused on offering higher frame rates (HFR) and high-dynamic ranges (HDR) to consumers. As the cord-cutters and cord-nevers markets continue to grow, so will new OTT opportunities that extend beyond VOD to live events and live-linear offering. Media companies need to strategically reinvent their portfolios to get ahead of the consumer viewing shifts occurring in the industry.